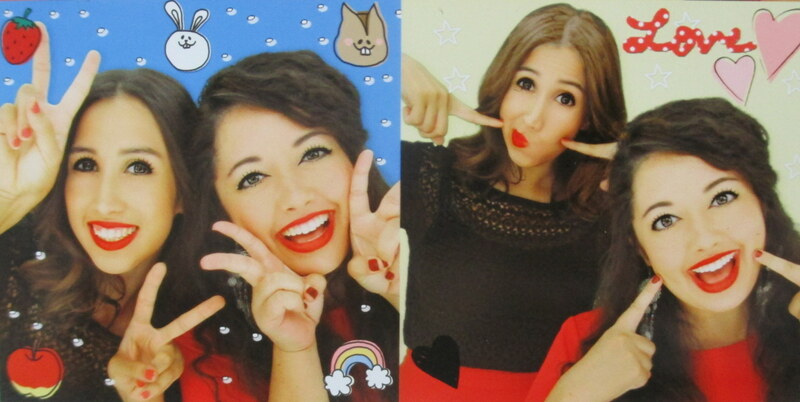 In this post I will attempt (key word: attempt) to instruct you on how to use a photo booth here in Korea. I have been in Busan for a week and have already taken three sets of photos. Vanity is not part of that equation. Personality-wise, Monica has discovered that I am a cat. She is a dog. 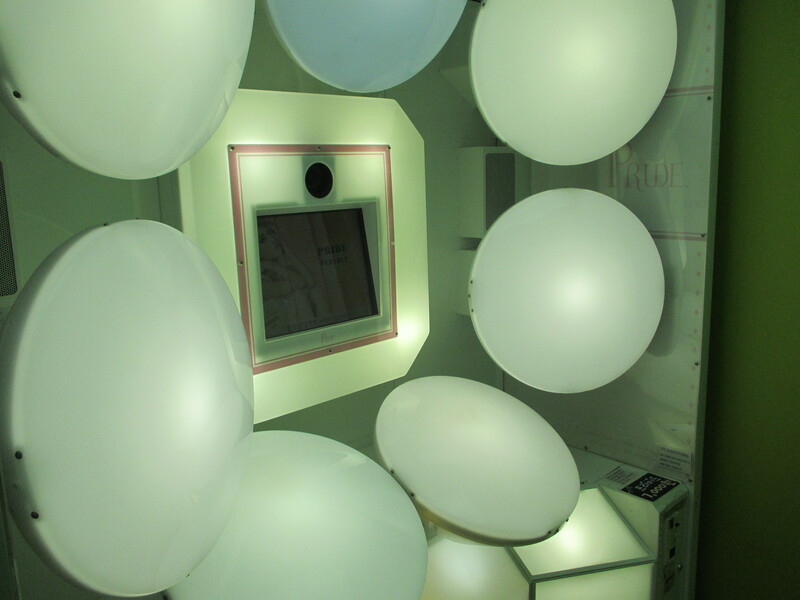 A solid photo booth place to visit in Busan is in Seomyeon, apparently the most crowded area in the city. Although I cannot give proper instructions on how to get there, I know the route by heart. Monica and I passed the place last Thursday on the way to Pie Wang, a restaurant where you can get great meat pies. I highly recommend eating there – the woman who owns it is awesome and the food is delicious. My experience with photo booths is very limited. I remember wanting to do it in the store called Hello Cutie in the late 90s and early 00s. I used to buy anime related items – namely Sailor Moon, Mobile Suit Gundam Wing, Inuyasha, and Tenchi Universe – and look longingly at the two booths that were inside. Upon entering the store, you will hear the screams and laughter of other people. I think it is impossible to have a silent experience. At the one Monica and I went in Seomyeon there are probably twenty or so booths. 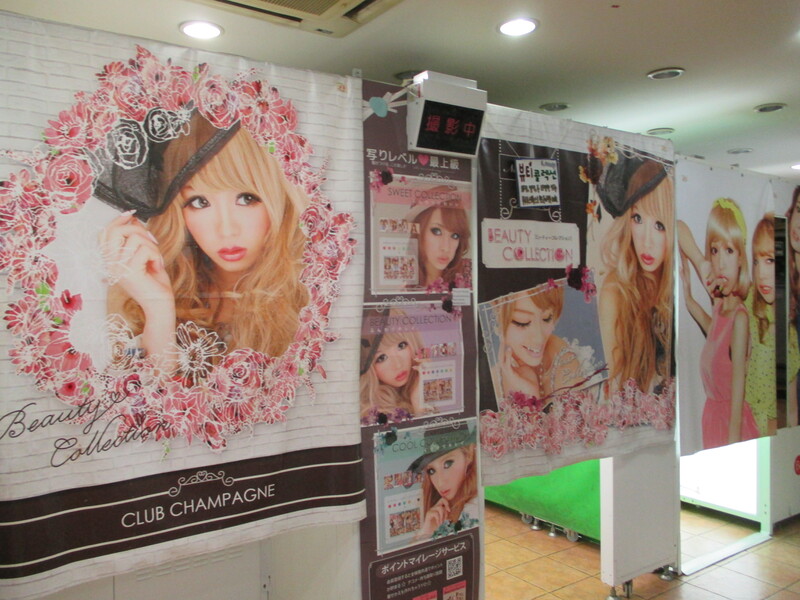 Different styles are offered – you have to creep around, look at the tarps covering the booths, and decide which one you want the most. Once a decision has been made, walk into the picture-taking enclosure connected to the editing booth of your choice. I recommend having a game plan (aka pose plan) prior to putting your money into the machine. Monica and I full-on panicked when we went on Saturday (hence why we had to have a “Redemption Tuesday”). The machines take ₩500 coins and generally cost around ₩7000 ($5.92) per session. You do not need to bring a bunch of coins to the store – they have machines that will change your bills to the coin equivalent. The most important thing that you have to remember is that everything is timed. Once you throw your money at the machine, various countdowns dictate your every move. For the one I chose, I had five seconds to pick between a “cute” or “cool” style. Next I had ten seconds or so to choose how light or dark I wanted my photos. Then I had twenty seconds to pick the first three backgrounds I wanted. After that, I was given twenty more seconds to select three more backgrounds (sometimes you get more than six, other times you do not). Once I chose the backgrounds, the countdown began. Monica and I planned out all six poses we wanted, so when the three-five second countdown began we seamlessly moved into our proper positions. After taking the photographs, you get to choose which ones you would like to move forward with and the layout you want (sometimes the layout will be asked at the end of the editing process). The next step is to leave the picture-taking-area and enter the booth for editing. 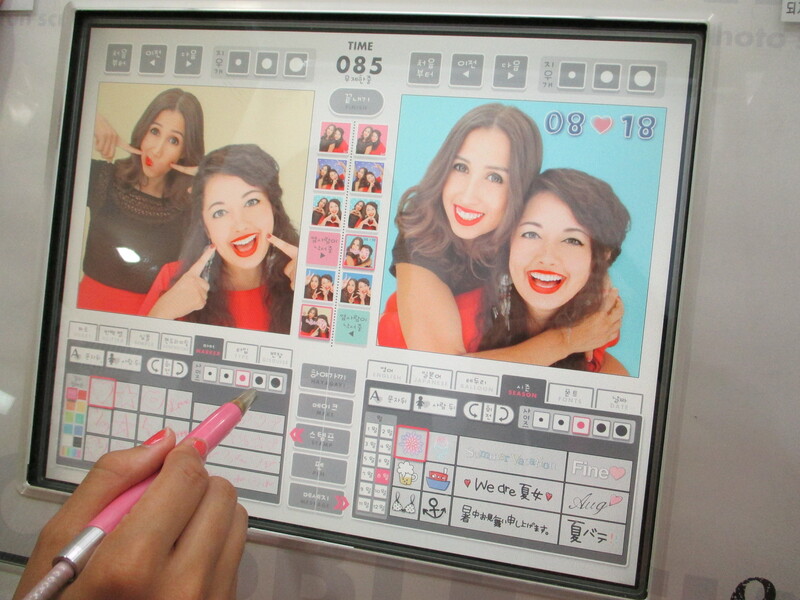 Each editing section provides pens that you can use to edit your pictures with. You will see a countdown, but don’t stress out too much because it will stop at 100 seconds or 85 seconds for a few minutes. Once it moves after that, however, you better finish up because you will be stuck with whatever you have already done – whether you like the edits or not. Note that the time has frozen at the 85-second-mark. Most everything is in Korean or Japanese. Monica and I tried three different booths and one of them had absolutely no English whatsoever. Don’t fret though, just push the buttons until you figure out what is what (seriously my advice is incredible – you are welcome). Not only can you “write” on the photos and throw stickers and borders on them, but you can also edit your face! Do you want a v-line face? Do you want thicker, longer eyelashes? Do you want bigger eyes in general? Do you want pink lipstick? Well, you’re in luck! Do note that not all machines allow you to do all of these features (the one with no English only allowed for eye enlargement). I was too hesitant to do anything other than give myself some incredibly luscious eyelashes, but Monica and I plan on going again (HEAR ME OUT BEFORE YOU JUDGE) without makeup and see what we can fake later with editing. Call us researchers, scientists, and/or geniuses. I increased the size of my eyes in the left picture. Once you have finished editing your photos, check to see if your machine gives the option to have a picture sent to you via Bluetooth. You can only choose one out of the set. The screen for this is generally right above where your printed photos will come out (the pictures might be in sticker form). Unfortunately for us, Bluetooth did not connect to Monica’s iPhone. We ended up spending a good hour last night trying to take pictures of our pictures. Hopefully you will have better luck than us! 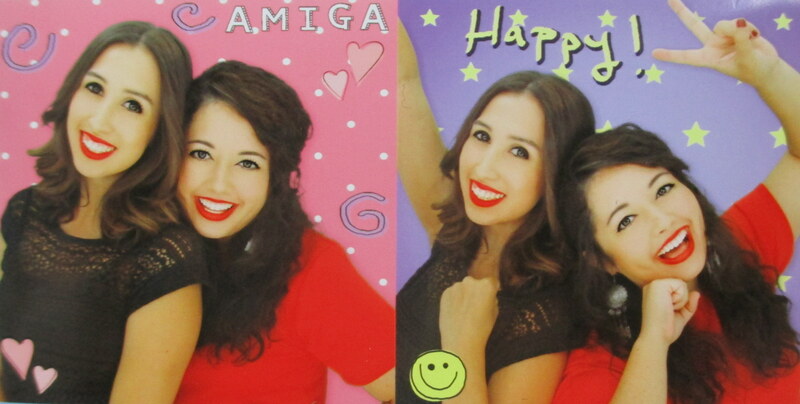 I am not sure if this post has been helpful, but I totally recommend going to a photo booth place. Yes, we panicked and actually started sweating from the process, but it was totally worth it. Sorry my pictures are not very clear, time was not on our side. I had initially wanted to take great photos highlighting each step, but that obviously did not happen. On another note, I bought three bags of shrimp chips yesterday. I have already downed four or five bags. Happiness. Complete and utter happiness. 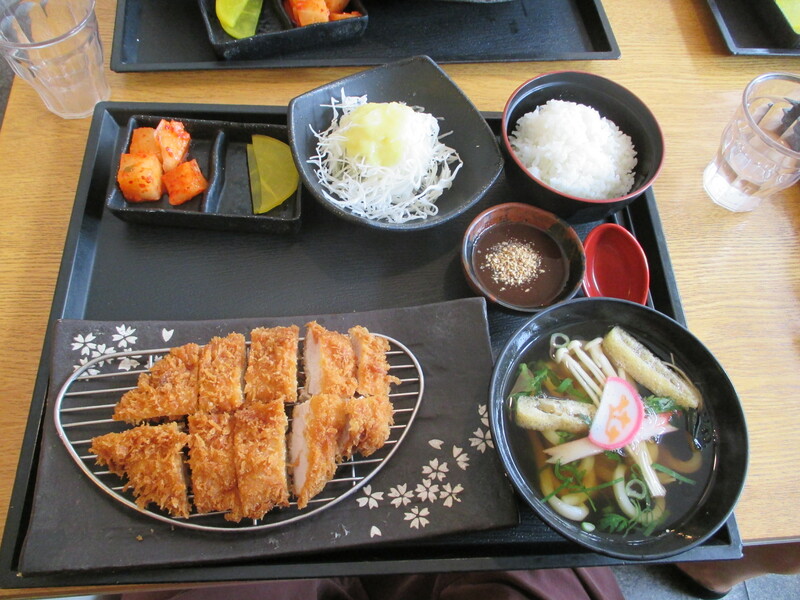 Korean: Donkatsu (돈까스). Japanese: Tonkatsu (とんかつ). Lastly: My friends and I just got back from throwing a flying disc on Gwangalli Beach. Monica and Brent had a lovers’ quarrel, which means they threw each other in the ocean. I happily stood on dry sand, pleased with my singleness. The view of Gwangalli at night is absolutely magical. The neon lights of the buildings and Diamond Bridge really make the place come alive. Eunhyuk of Super Junior was where I was just standing last night, so that has to count for something.